The popular response to budget flights and low cost airlines has been quite dramatic. Short inexpensive air travel for a few days is popular with discerning tourists across the globe. There are dozens of low cost carriers connecting hundreds of airports, countries and continents worldwide. Several airlines seem to offer interesting route maps and fares just under those offered by normal carriers. There is a range of package offers from budget flights. A curious traveler can experience the best of Hanoi with a great value package including accommodation facilities, cruise and meals; take a special flight to Denang and enjoy a four star resort comfort; experience the best of London with unbeatable 'London Value' including return flights with accommodation vouchers and car hire. Get a perfect glimpse of Dublin with a mini break including three nights accommodation and city tours and more; take the family to Fiji including six nights at the exotic Sonaisali Island with return flights and airport transfers and lots of freebies; experience historical Rome with airfares that offer value for price and couple it with a Rome sightseeing tour. Budget flights are not just priced with cheap tickets but provide real service as well. Nowadays budget airlines pre-assign seating during booking to avoid confusion. Decent legroom comforts are also provided onboard. Many airlines including Qantas, Emirates, Cathay Pacific, Thai, Malaysian, Singapore airlines and Virgin Atlantic offer early bird airfares. Most early bird fares are based on the destinations, be it Aberdeen or Amsterdam, Vienna or Zurich. Most common ports occur in zone one; while less common are in zone two the furthest ports are in zone three. The price changes accordingly. Such amazing deals and space are extremely limited and rare of course! Sometimes airlines allow one child under age 12 years to travel absolutely free when traveling with two adults. And yet there are flights that offer business class airfares and air travel deals to world class destinations. The luxury and comfort of business class travel with savings up to a whooping 65% can be enjoyed by a novice or a road warrior during the weekend or even during the week. A wide selection of in-flight amenities like fax machines, high speed wireless Internet, accompanied by complimentary beverages and snacks are all offered along with the special discounts on hotels and cheap car rentals. Discounts vary based on seasonality, seat availability, restrictions, advance booking and minimum stays. Discounts of 65% on full published unrestricted airfares are available on certain flights. There are airlines which facilitate lowest possible fares if booked at least 21 days in advance with a Saturday night stay. Seasonal travel deals are most of the time discounted. Great spring savings on flights to Acapulco, San Juan or San Diego and other exotic destinations are fun. The cheapest flights can be sourced online and airline websites have thousands of flight destinations listed out, be it Sydney Australia or New York US or some last minute cheap flight to Paphos in Cyprus. Hundreds of customers are benefited by such cheap ticket offers every year, making use of great flying deals. Such cheap flights to America are noticeably always on demand and there are best prices offered on flights to New York, Boston or Los Angeles and even Las Vegas where money saved could be better spent on the casinos instead! Upcoming destinations like Turkey or Dalaman, Bodrum or Antalya are in hot demand these days and this sector seems to be fast improving. Whether for fun in Florida or adventure at Bangkok or for film lovers flocking to New Zealand, cheap flights can get your where you desire to go. Passengers can fly on any route they wish to travel in budget airlines or no frills airlines just by booking their tickets using a simple search tool over the Internet. A comprehensive low cost airline guide is available to support the traveler. 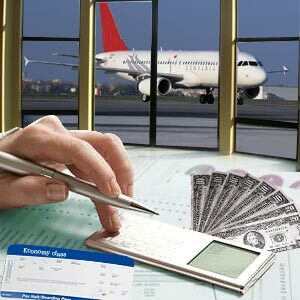 The best budget flights and low cost carriers can be searched and accessed by using such guides. Some large and well-knit Internet travel sites for immediate reference of air travelers: travelocity.com, expedia.com, priceline.com, previewtravel.com, itn.net, americanexpress.com, travelweb.com, hotwire.com, orbitz.com. By and large, there are primarily three types of airfare websites. Aggregators, traditional booking engines and airline's own websites. Aggregators like Kayak check airfares from many different airlines and do not charge any additional fee. Instead they rely on hotel deals and onsite advertising to make their money. Aggregators: Farechase, Kayak, Sidestep and Farecast. Booking engines: Travelocity, Orbitz, Expedia, Cheaptickets, Hotwire, Priceline It is not possible to get the lowest airfare using the same website every time. It will fluctuate quite a bit each time. While airline wholesalers provide cheap fares and tickets can be comfortably purchased for less than the normal price, beware that there are numerous scammers online and they should be avoided diligently. When booking is made through a travel agent, it is important to specify 'lowest possible fare'. There may be special fares which do not fall under 'economy' or 'APEX'. It should be remembered that buying a ticket on the Internet is not the same as getting the cheapest price. One has to make comparisons and make a deal boldly. One strategy would be to look at the best value, fully-refundable fare early, then continue looking for something better to pop up on screen. A shrewd passenger can detect that although an attractive price is offered on the main leg, it may be high on the connect. Under such circumstances, try reversing the search or book one leg at a time. Three hours between flights for international departures/changeovers should be allowed. Most of the agents of airlines that offer cheap tickets with budget flights work directly with wholesale fares having contracts with major airlines along with waiver fares. It is thus possible for them to deliver to their customers' exclusive offers with lowest possible unbeatable price. Most international and domestic airlines offer the selling agents discount on volumes which makes cheap fares possible. Best deals are very often offered directly by airline websites. There is also a facility to sign up with the airlines and notify via email of incredibly cheap specials a few days before the flight although it is hugely restricted. This offer is available with American, United, Continental, Northwest, Southwest, US Airways, Delta, Alaska, Canadian, Carnival and Cathay Pacific to name a few leading airline services. The automatic reservation systems give leverage to clients with more options to get best value for money. Nowadays instead of advance booking, passengers seem to purchase tickets a few hours before the flight and take advantage of the last minute discount offers. On the other hand, with some airlines one can attempt to get cheap airfares by booking the ticket well in advance. Whereas, late bookings may lead to buy a ticket that is even costlier than usual. There are certain days in a week that online tickets are sold cheaply, say Thursdays or Tuesdays. Save travel expenses by choosing to travel on the days when the airfare is cheaper. It is common for foreign airlines to sell discounted tickets in bulk to bucket shops in ethnic neighborhoods which mostly serve their own nationality. For instance, a travel agency in Koreatown in Los Angeles would offer good deals on Korea Air to Seoul. Similarly, Chinatown in San Francisco runs specials all over the Asian continent with a dozen or more travel agencies. Such competitive bucket shops can be found in London, Brussels, Amsterdam, Athens, Istanbul, Cairo, Tel Aviv, Bombay, Bangkok, Kuala Lumpur, Sydney and many other cities including Hong Kong. Government taxes and fees are not included. Fares are often subject to availability. Certain black out dates may apply. Cheap airfare on international flights allow for savings. It is domestic flights that usually cost more than international flights. These days valuable information on cheap airfares and budget flights can be sourced from the Internet. What is more pertinent is the fact that when searching for a cheap airfare ticket; make doubly sure that the source of cheap airfare is legally registered and has all the necessary credentials. First Published Date: 11 Nov 2008 Last modified Date: April 25 2019 This page may have been updated recently as new information is available or the content may have been edited for better readability.